Topics: Pre-leasing Special, Storage Sizes, Penske Rentals, and Sparefootspecials. 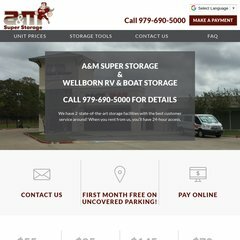 aandmsuperstorage.com A&M Super Storage Inc :: Storage & Moving Solutions :: College .. The programming language environment is PHP/5.3.5. It is hosted by Softlayer Technologies Inc (Texas, Dallas,) using Apache/2 web server. ns1.thematthewsgroup.com, and ns2.thematthewsgroup.com are its DNS Nameservers. PING www. (75.126.145.180) 56(84) bytes of data.